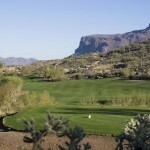 Dinosaur Mountain Course is the more famous of the two golf courses known for its views of the Superstition Mountains, unforgettable elevation changes and fairways that begin generous off the tee box, then tighten as the course progresses. 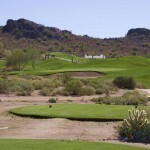 Desert carryovers and long winding fairways make this course a fun and welcomed challenge. With being the #1 rated desert golf course in Arizona, you will have some of the most amazing scenic golf shots a golfer could dream for. Sidewinder Course is more subtle located towards the base of the mountain where elevation changes are minimal. Sidewinder is not the same grand caliber of its sister course; however, it does offer a welcomed break from the treacherous terrain of Dinosaur Mountain. The greens are large and easy to access, meanwhile, winding fairways snake around the base of Dinosaur Mountain through dry desert creek beds and desert terrain. Scenic Fact: Hole 4 of Dinosaur Mountain offers amazing views of the city and the Superstition Mountains from the elevated tee box. Spike Policy: Yes, soft spikes only. Metal spikes are not allowed. Changeovers are available for $10/pair plus tax. Bar: Yes, full service bar is located at Greenwood’s Bar & Grill. Take the AZ-101-LOOP S exit, EXIT 9. Merge onto AZ-101 LOOP S.
Take the US-60 E/ US-60 W exit, EXIT 55. Merge onto US-60 E via EXIT 55A on the LEFT toward GLOBE. Turn LEFT onto S KINGS RANCH RD.